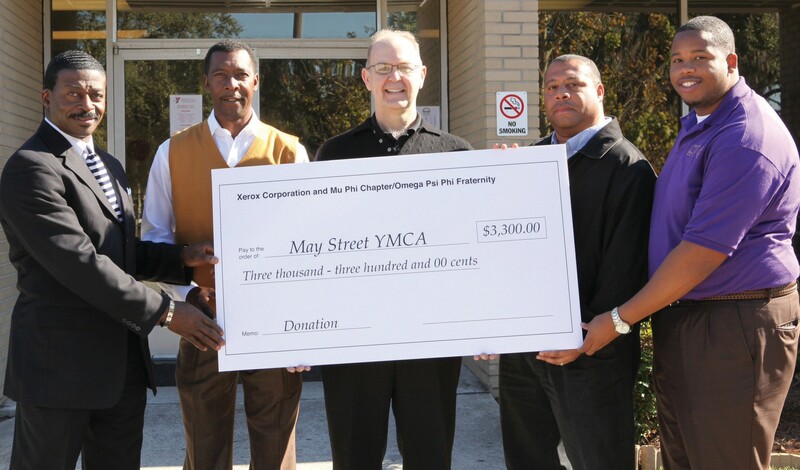 Xerox Community Involvement Program partnered with the local chapter of Omega Psi Phi Fraternity, Mu Phi Chapter, an international service organization that is very active in the Savannah community. They identified this program as one that stood out in the community and could benefit from financial support and local volunteers to help mentor and serve as role models to some of the young people being helped. Xerox recognized the need and the alliance was created to reach out to the Savannah youth through this amazing program at the West Broad Street YMCA. Together, the amount of $3300 was contributed to the Teen Success Club and both organizations have committed to support the program through volunteering, mentoring and speaking to the youth about different career paths and the impact of life choices. The Teen Success Club is available to any student currently attending school in grades six to twelve. The Club promotes civic responsibility, academic achievement, character development, and career pathways. Along with community service and recreational activities, club members also develop, with volunteer and staff mentors, a high school graduation plan, a post high school career plan, visit colleges and universities, are assisted with SAT and CRCT preparation, and get to interact with different professionals in the community to learn about career opportunities. The West Broad Street YMCA is one of five Heritage YMCAs remaining in the country. Started in 1942 when Black soldiers were denied services at the then legally segregated YMCA, it was charted with YMCA of the USA in 1947. Originally located on what is now MLK Blvd., the Y moved to its current location on May Street to serve the Public Housing Authority neighborhoods of Kayton and Frazier in 1968. The West Broad Street YMCA now serves all of downtown Savannah, providing quality early learning, before and after school programs, summer enrichment, GED classes, adult job preparation, a public library, swimming, an organic garden, and recreation. Its mission is to prepare children and adults to achieve their maximum potential. To learn more, contact the West Broad Street YMCA at 912 233 1951 or visit www.westbroadstreetymca.org.